Welcome to the Enclosed Garden of Susan Ernst. Literal as well as figurative, this blog explores the physical gardens which I cultivate, the spiritual garden within, and the intellectual garden of horticultural knowledge gathered through decades of study, observation and practice. Come and sit with me for a while. Let us together marvel at the delicate, intricate beauty of a flower. Here is the last set of monthly garden photos for the blog challenge 12 Months in View. There is approximately 30 inches of snow in these photos. We had four snowfalls in two weeks time. It is that time again. Wishing that spring begins in February. I so need to be outside for more than a quick walk to the mailbox. View through the dining room windows this morning. The crocus is one of the first flowers to bloom, about the same time as the snowdrop and before the daffodils. Depending on the species and the locale, crocuses can bloom in February or March. Some varieties even bloom in autumn. As a general rule, it is what are called the species crocuses that bloom earlier than the larger, showier Dutch or hybrid crocuses. Regardless of variety, crocuses are always a welcome sight after a long, barren winter. Crocuses are easy to grow. All they need to thrive is full sun and a well drained soil. Buy and plant corms (what the bulbs are called) in autumn. Add organic matter such as compost, or a commercial fertilizer made for bulbs, at the time of planting. Crocuses are hardy plants that increase year after year. They are best planted in mass for a striking display. Since the corms are relatively small, they are easy to tuck into the soil around existing plants. Plant them among perennials, at the base of shrubs and trees, even in the lawn. By the time the grass is ready for its first mowing of the season, the leaves of the crocuses should have created and stored up enough energy to flower again next year. Crocuses, like so many other plants, have traveled the world over the centuries. Originally native to the Mediterranean, North Africa and Spain, it traveled to China with the Mongols. It arrived in England in the sixteenth century and to the United States in 1740 when Peter Collinson of England sent John Bartram over twenty varieties. Ancient artifacts have been discovered providing evidence that crocuses were cultivated even in antiquity. Pottery decorated with the image of crocuses was found in Crete which dates back to 1500 B.C. An ancient scroll from 1552 B.C. describes the medicinal uses for crocus. There is also mention of it in the Song of Solomon (4:14), where it is referred to as saffron. Saffron is one species of crocus (C. sativa) prized for the orange pollen that has been used as a seasoning and dye since ancient times. The cost is extremely expensive as you would imagine. It takes over 4000 crocus flowers to make an ounce of saffron. Folklore regarding the crocus revolves around love. According to Homer, the marriage bed of Zeus and Hera was made out of crocuses. Ancient Greeks decorated their wedding banquets and marriage beds with crocus petals. 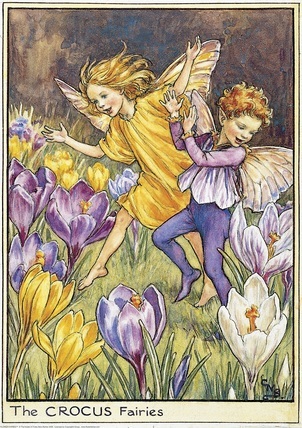 There is a mythological story of how Crocus was turned into the flower he is by Aphrodite because of the love he spurned from the nymph Smilax. 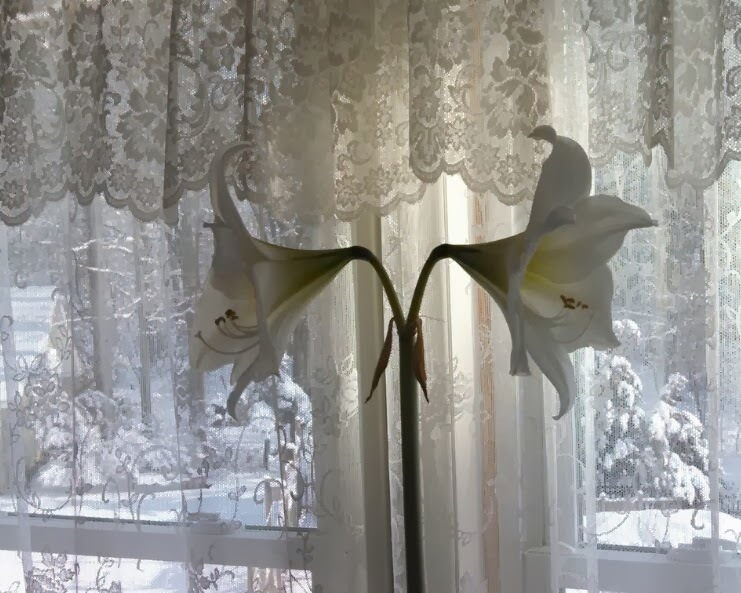 In Victorian times it was believed the crocus inspired love and so was sent between lovers. A short poem by Ella Wheeler Wilcox (1850-1919) uses the crocus and other flowers to contrast the differences between two lovers. Why not give (or request) a bouquet of crocuses this Valentine’s day instead of roses? I have very much enjoyed researching and writing about each of our twelve flowers during this past year. I hope you have enjoyed reading the articles. Note: all images in this article are copyright free. I have obtained them from Wikimedia Commons. If you click on the image it will take you to the original site. "Flowers always make people better, happier and more helpful; they are sunshine, food and medicine to the soul." Of all the joys a garden can bestow. These garden joys till summer comes again.